Eastern Aroma: Got Guilt Mommy? Pause.Have some Chocolate Truffles. Got Guilt Mommy? Pause.Have some Chocolate Truffles. Yesterday I got a frantic call from a friend; her toddler is my daughter’s classmate at the playgroup. We all met up at the time of admission and bonded well while our kids were adjusting to the new school environs. Now If I have to sum up the purpose of the call in a word then I’d call it GUILT. C’mon let’s admit which one of us has not faced it, especially the working moms. Gosh we are smothered with it. Going back to her call –This friend of mine quit work when she had a baby and now (after a good two and a half years later) thinking of joining the workforce back. That’s HUGEE, so I congratulated her and then I hear her whimpered voice, asking if she is making the right decision. She wanted to know if the daycare my daughter goes, is good enough for her child too. Will they love her and feed her milk the way she is used to having at home. I wish I could answer a loud Yes, but I guess no establishment in the world can replace the mommy care. Right? I wish I could sum up my experiences in one single phone call and somehow explain that inspite of all odds it’s still all right to go back to work. I have experienced it first-hand that being a working mom of a young kid is the hardest thing ever. I wish I could convince this harried and hesitant mom who is being so hard on herself that it’s all going to be okay, and that someday we would laugh about it all, even the tough days. There are no yardsticks and no measuring tape …just like there is NO perfect mother . We are one of those moms who come home late. We work really hard, and like everyone else come home to put away the scattered toys and cook the family favorite and inspite of all odds we will read that bedtime story and kiss the bruises goodbye. 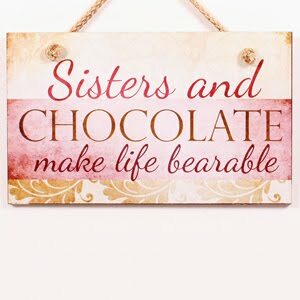 We will sometimes wear an unmatched earrings or an un-ironed shirt to work, just to trade off that time for baking every little ones favorite chocolate balls. Now scoot mom. Enjoy the mommy time. Bake this with your little one and bite. Since our world is so covered with guilt , at least these chocolate truffles make you forget abstinence and denial for once. 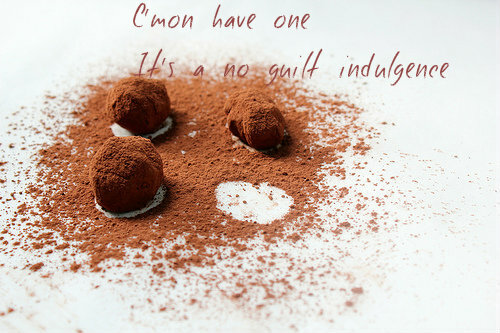 And I promise that these Chocolate Truffles have half the calories and 75 percent less fat compared to regular truffles. Hallejullah! 2 tbsp cocoa and 1tbs powdered sugar. Combine all ingredients in preferably a processor and give it a whirr till it forms a smooth dough. The dough will be moist and sticky so chill it for a few hours before forming the balls. Once its chilled, roll it into small balls and generously dust the balls in cocoa powder and refined sugar mixture. Freeze for a firmer truffle. Enjoy! looks delicious and d pics n quotes so pretty..vl try dis next time. 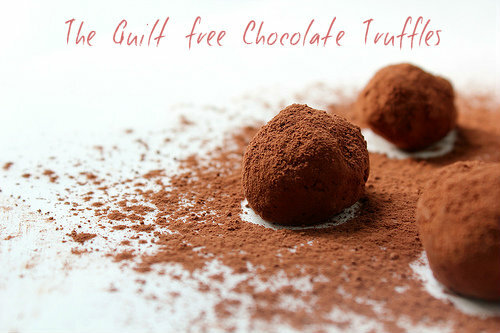 I love the less calories truffles. For sure I won't feel as guilty after eating half a dozen. :) I know, it's not easy to leave the kids in the care of someone else's and back to work. It's never easy.